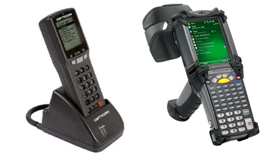 American Eagle Systems has developed some of the industry leading barcode scanning devices. Our RFID and Data Collection devices have software developed specifically for tape library and asset environments. We have done considerable research on what features and functions are necessary for the most productive and accurate devices on the market. Whether for movement, inventory, or archival purposes, our units can quickly audit your assets, ensuring that the correct tape numbers and devices are being entered into whatever system you use. Since the software on these devices is developed in-house, we also have the ability to add customized features to fit your process. Multiple users can scan with the devices at the same time with different units. Devices do not need to be hooked up to software during scanning. Our proprietary software allows continuous scanning, eliminating the need to press a button to scan each tape. Devices can be used anywhere, no limit from software restrictions. Can be scanned at the Vault and downloaded at the library. An additional feature of our DCD allows the user to type in a missing volser number or a damaged tape number. Devices have internal memory that allows users to download scan file multiple times. DCD Barcode Scanner scans upwards of 6,000 tapes per hour while RFID devices can scan upwards of 12,000 tapes per hour. Fixed Length - Allows the user to select the required label length. If the users scan a label that differs from the desired setting, an error message will prompt the user that the barcode is invalid. Variable Length - Allows the user to scan any barcode of any size. Sequence Check - Alerts the user if tapes are scanned out of sequence. Used for making sure tapes are filed correctly and finding misfiled tapes. Row Check - Alerts the user if a gap of tapes is missed. Used during inventory to alert the user of a missed row or rows. Illegal Character - Checks scan for all odd characters and will alert the user if a bad scan is encountered. Container Tracking - Prompts the user to scan a container number. Then prompts the user to scan the tapes inside the container. Forces the user to scan the same container number closed before a new container number can be opened. Used anytime container inventories are performed, the opening and closing of containers forces error checking and eliminates mistakes. Inventory - Allows the user to scan tapes while using any of the Scanning Options or Scanning Checks above. Scroll and Query - User can scroll through database or query for an individual tape number at any time. Last Scans Display - The last three scans as well as total number of scans are displayed on the DCD at all times. Using this the user can always tell where they left off.